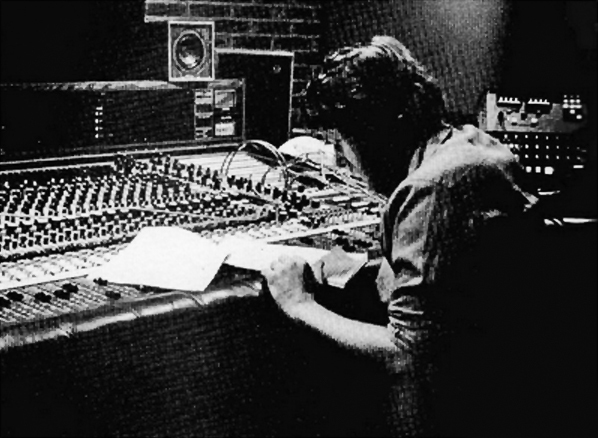 Just heard the sad news that record producer Martin Rushent died last Saturday, aged 63. His best remembered album, the electro-pop masterpiece ‘Dare’ by the Human League, issued in 1981, was a runaway success, becoming an international best seller and winning Rushent the Best Producer award at the 1982 Brits. Apart from the Human League, Rushent produced artists including The Buzzcocks, The Stranglers and XTC. In 2007 he released his own single (as Martin Rushent Presents Disco Unlimited), ‘Itchy Hips’ on Tirk, the label that issued my ‘Credit To The Edit’ compilations in 2005 and 2009. This will always remind me of weekend nights at Wigan Pier in 1981 (I was the four nights a week resident at the Pier between 1980-82). I played a real cross-section of stuff at the weekend, including the biggest tracks from the Tuesday Jazz-Funk night, the more mainstream dance singles (things like Shalamar, Imagination, Kool & The Gang etc), and best of the British Futurist releases, by artists who were enjoying enormous popularity at the time, including Soft Cell, Gary Numan, Heaven 17, Visage, Orchestral Manoeuvres In The Dark, Depeche Mode and, of course, The Human League. 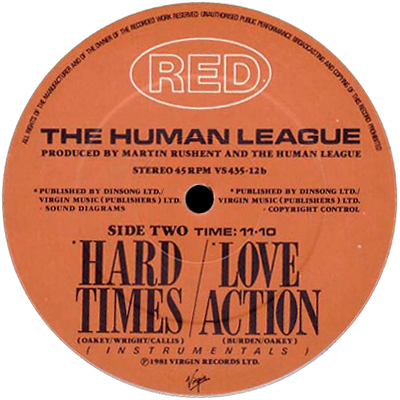 ‘Love Action’ was one of a quartet of hits from their hugely successful album ‘Dare’, but the 12” included the additional bonus of “Hard Times”, which segued straight into “Love Action” to dramatic effect, sounding amazing over the Pier’s system. Furthermore there were both full vocal and instro options on the 12” (the instrumental later appearing on the groundbreaking 1982 League Unlimited Orchestra album, ‘Love And Dancing’ – which included tracks from ‘Dare’ brilliantly remixed in a dubbed-out style by producer Martin Rushent). This is the first 12” I can remember doubling-up with at the Pier, playing one copy a few beats behind the other, repeating sections, and switching between the two sides. I’d also utilize the clubs third deck by running the “hey you, don’t watch that watch this…”spoken intro, from ‘One Step Beyond’ by Madness, over the section on the instrumental side that linked ‘Hard Times’ to ‘Love Action’. It fitted absolutely hand in glove, with the powerful ‘Love Action’ beats kicking in as the voice said “you’d better start to move your feet”, whilst the Pier’s light jock, Paul Vallance, got in on the act with some suitably dynamic visual accompaniment. So sad to hear this bad news. Love & Dancing is an incredible remix album. I only discovered it last year when I bought the LP for 20p in a charity shop. I didn’t really look properly at the cover and thought I was just buying a Human League album. When I got it home and on the turntable however, I was absolutely blown away! It really was way ahead of it’s time in terms of dance music, Rushent was so talented. Absolutely cannot wait until next month’s listen! Brilliant Greg, I’m made up about L2M. Feel really saddened by his passing. 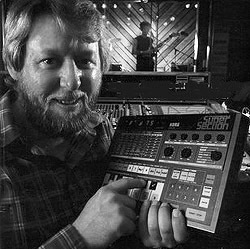 A truely great & highly influencial producer who was ahead of his time.